Emily’s Frugal Tips recently partnered with GhostBed to try out their new GhostBed mattress and foundation. My daughter had been sleeping on an old worn down pillow top mattress that was handed down to her from a family member for quite some time. We knew it was time to replace it when she started getting back aches. Luckily we found GhostBed and they offered to give us a mattress and foundation in exchange for an honest review. GhostBed is offering my readers $50 off instantly when they purchase a mattress of their very own! You do not have to use their foundation but it is recommended, however, the foundation does cost extra. The interesting thing about GhostBed’s foundation is that you have to build it yourself. It wasn’t a big deal, and really took only about 30 minutes to do. My kids could not find the correct bit for our electric drill so in the video you will see them using a screw driver. We recommend to use a drill for faster assembly. The GhostBed foundation is to be assembled on a flat hard surface and it is recommended that you have 2 people to assemble it. I would not recommend trying to do it alone. You definitely need a 2nd person to help. There are wooden slates and top and bottom railings. You need to screw it all together, and then put the foundation cover on once it is all screwed together. The foundation comes with complete directions for setup. There is a 3 – year limited warranty on the foundation. It does not cover for abuse or misuse and you must register for the warranty within 30 days of purchase (which I forgot to do). Ghost Bed crafts perfection by giving you a mattress that has advanced cooling technology with continuous airflow. It is responsive and does not hold onto body heat because it naturally cools. Contains high quality high technology proprietary gel memory foam – within the middle layer of GhostBed Mattress is a awesome high quality memory foam gel. The mattress comes with a removable mattress protector! I discovered this when I was stripping her bed to take photos. If you like a firm mattress, Ghostbed rates 6.5 in firmness. My husband and I own a bamboo mattress and it is very soft and plush but it just sinks in when we lay on it. When we were offered the opportunity to receive a GhostBed I almost took it for myself but decided our daughter needed it more. My daughter’s GhostBed is firm and you don’t feel like you are sleeping on a bed of goose feathers. I don’t know about you but I don’t like sinking into a bed. I want it to feel somewhat firm but also a little plush. GhostBed seems to be perfect in terms of firmness, comfort and quality. We love this bed so much that we are thinking about purchasing a GhostBed Mattress for ourselves to replace our bamboo one. We even paid more for our Bamboo mattress than what we would be paying for this in a Queen size. GhostBed got its name from a fear of ghosts. The owner had a fear of ghosts and decided to give the mattress the name as a way to kind of overcome that fear. We thought that it was pretty cool he chose to name his invention after his biggest fear. There is a break in period. A new mattress puts the human body through some stress initially as the body gets used to the feel and comfort of a new mattress. So you need to realize that you may not like it right away. Some GhostBed Reviewers were saying that they felt the bed was too soft, and that they could not sit on the edge of the bed without falling off. I don’t understand how that can be so because we did not have any issue with it not being stable. I am a plus size woman and I was still able to sit on the edge with no issues. The Ghost Bed Mattress came rolled up, encased by plastic, and tightly fitted into a long cardboard box with the Ghost Bed Logo. You open the box (note in video my kids ripped the box to shreds but there is an easier wa), and the mattress will just plop out pretty easily. The mattress comes tightly compressed, and once air hits it the mattress fully forms. Lay the mattress on top of the box spring, cut the plastic wrapping off of it, and you will see as soon as air reaches the mattress the mattress starts to decompress. This takes only seconds but the mattress continues to grow for several weeks after. You are able to immediately sleep on the Ghost Bed mattress with no issues. My daughter did accidentally cut the mattress when she was removing the plastic wrap, so be careful of this. It has been about 4 months since my daughter received the mattress and foundation. What we have noticed is back aches are completely gone. The mattress is firm, has held up very well, and continues to be comfortable even 4 months later. 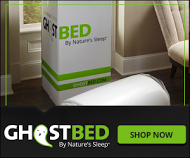 GhostBed Mattress comes with a limited 20 year warrant and free shipping. Right now my readers can get $50 off instantly with any size mattress. Are you still using your Ghostbed? If so is it still as good as when you wrote this review? 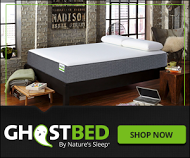 We are choosing between this and Casper and so far almost everything we’ve read (like https://www.bedowl.com/compare/ghostbed-vs-casper) has them even scores. Any feedback would be appreciated, thanks! Hi Ryan, it is my daughters bed and she still loves it. When we first got it I instantly regretted giving it to her because its so comfortable. I have also heard good things about Casper.